Quick overview The foundational economy means those universally necessary goods and services that form the basis of a civilised life: everything from clean piped water to decent health care. In the last generation privatisation and outsourcing have degraded this provision. The book documents all this, and shows how it can renewed. -- . Privatisation, market choice, outsourcing: these are the watchwords that have shaped policy in numerous democratic states in the last generation. The end result is the degradation of the foundational economy. The foundational economy encompasses the material infrastructure at the foundation of civilised life - things like water pipes and sewers - and the providential services like education, health care and care for the old which are at the base of any civilised life. This book shows how these services were built up in the century between 1880 and 1980 so that they were collectively paid for, collectively delivered and collectively consumed. This system of provision has been undermined in the age of privatisation and outsourcing. 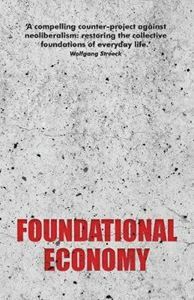 The book describes the principles that should guide renewal of the foundational economy and the initiatives which could begin to put these principles into practice. -- .